Surrey Satellite Technology has released the first images from NovaSAR-1, the world’s first commercial synthetic aperture radar (SAR), with Sydney well and truly in the picture. The S-Band SAR images were taken using the satellite's strip map mode at six-metre resolution, and are 20 kilometres wide by 87 kilometres long. NovaSAR-1 is a technology demonstration mission that has been launched into a 580-kilometre orbit, with the Commonwealth Scientific and Industrial Research Organisation (CSIRO) signing on as a mission partner. The image of Sydney was taken at night, and shows several notable locations like the Harbour Bridge, the Opera House, the Royal Botanic Garden, and others. Sydney was one of the two chosen locations to be photographed, with Cairo, Egypt the other. Director of Earth observation at SSTL, Andrew Cawthorne, said his team is thrilled at the outcome of the images. "We have worked closely with the SAR experts at Airbus in Portsmouth to develop NovaSAR-1 and the whole team is delighted with these first results - the outcome of space engineering expertise, ingenuity and collaboration," Cawthorne said. "Over the coming weeks our spacecraft operators will continue to test the capabilities of the spacecraft as we task the satellite to image locations around the world, working towards the start of service delivery to our mission partners in the near future," Cawthorne said. 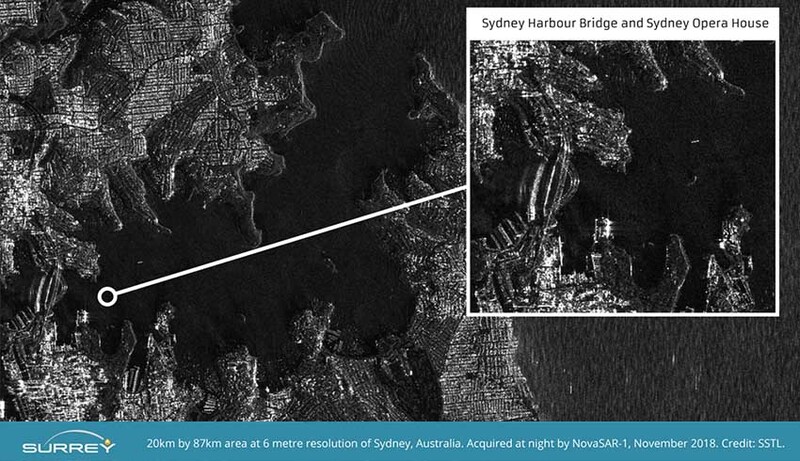 A close up from the original image of Sydney shows boats moored in Church Point, which SSTL said demonstrates the "usefulness of SAR for detecting vessels of many different sizes and types, particularly at night or through cloud cover". NovaSAR will provide the CSIRO and wider Australian research community with access to an advanced form of radar technology, including S-band SAR providing high-resolution images of Earth from space.